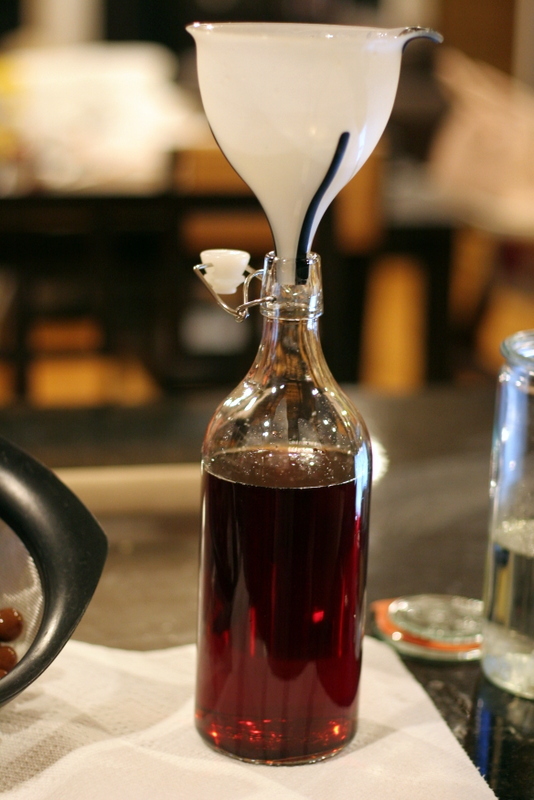 Other posts on this project: Sour Cherry Liqueur Pt. 1, Dark Cherry Liqueur Pt. 1, Blackberry Liqueur Pt. 1. 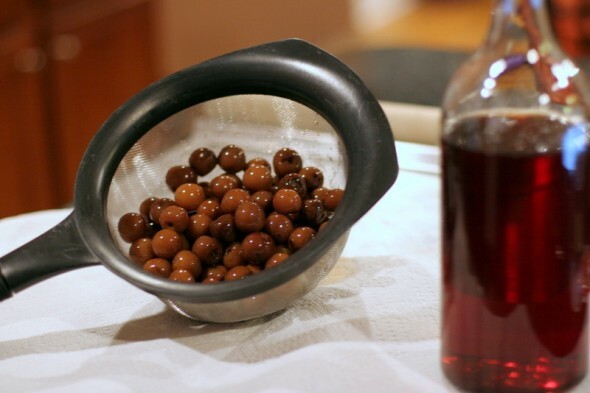 Waaaay back in the summer of 2012, I started the process of making homemade cherry and blackberry cordials with the fresh-picked fruit I’d gotten that season. I finished the first stage of the process and just let the bottles age and age. I meant to do something with them for Christmas 2012, but we were too busy with baby’s first Christmas to bother. So these liqueurs continued to steep and get more awesome in the cool dark of our basement (and then the darker corners of our kitchen) before I finally decided to do something with them right before the holidays. Basically, all that needed to be done was to strain the cherries and add sugar syrup to all three. I’d strained out the blackberries ages ago but never made it all the way through the process. 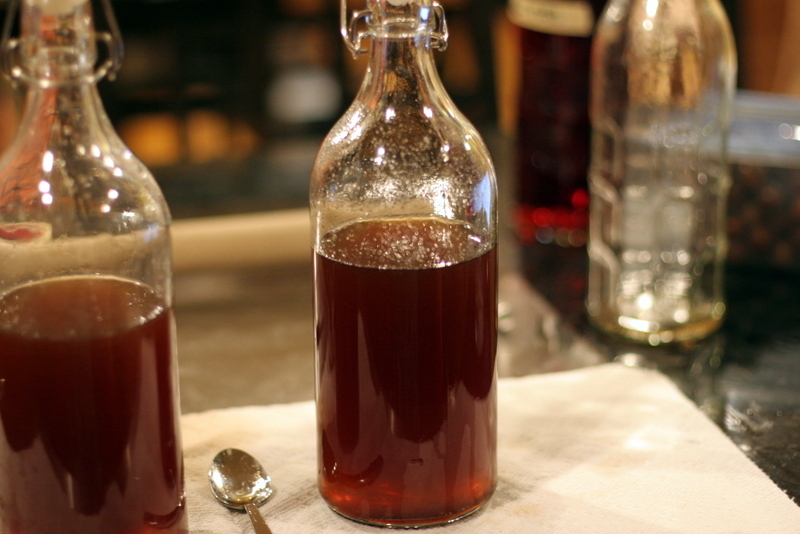 I’d used Homebrew Underground’s recipes for all of them (seriously, an amazingly detailed site), and the homemade Standard Sugar Syrup was thicker than your basic bar syrup but a more natural alternative to light corn syrup. I’d also made the sugar syrup ages ago, and I made a huge quantity. Most of it crystallized over time, including one bottle that exploded all over our bar. That left a spectacularly sticky mess, we ended up getting rid of the old bar in a yard sale (my kitchen experiments are not always pretty, but that bar had served its time). But there was still enough left to sweeten these three batches of alchohol to perfection. We now have homemade good stuff in the bar for future cocktails. And future holidays, the stuff really is delicious. After my homemade limoncello, I think I’m liking this kitchen brewing. 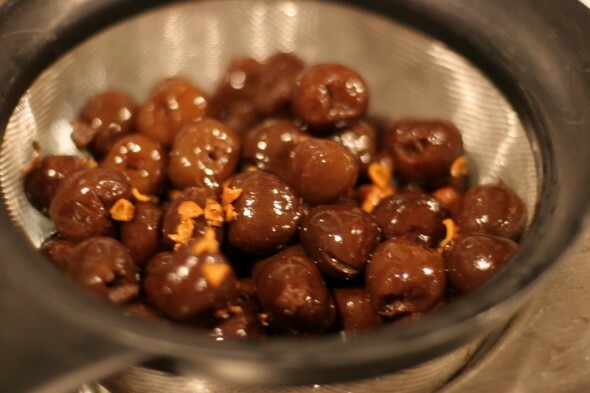 And there were some intensely pickled boozy cherries left afterwards. I should have given them away, we didn’t end up doing anything with them. This sounds so good and so much easier to make than the limoncello that my sister makes each year. I might have to experiment with this recipe.